A bright green food truck roving the Burlington, Vermont area is turning heads and doing a lot more than serving up lunch. "The Good Food Truck," as it is known, is a project of the Chittenden Emergency Food Shelf, which offers services including a pantry for neighbors in need, and a hot meal service for homeless clients. The food truck travels around the Burlington area selling meals and using the proceeds to benefit the Chittenden Emergency Food Shelf. But that is just part of the truck's mission. It also goes into neighborhoods that have high percentages of food-insecure people and serves free community meals. "It's really an amazing idea; a fantastic thing to do," said Julie Garabedian, who bought lunch from the food truck Friday as it was parked on Cherry Street in downtown Burlington. The Chittenden Emergency Food Shelf said in the summer, food donations can sometimes dip. The peak for donations is the holiday season, noted Kelly Saunders of the food shelf. "Hunger is year round; we say hunger doesn't take a vacation," Saunders told necn. "The food truck is bringing our mission to a higher visibility. We're reaching thousands of additional food-insecure people through the truck who may not currently come to the food shelf, and for paying customers, they're able to know that their money isn't just getting them something nice, it's also giving back." The non-profit was able to buy the truck thanks to a grant from Jane's Trust in Boston. On those free community meal days, organizers cook up donated food. For vending days, the chef purchases ingredients from local farms and bakeries. "It's good for your body in that it's healthy, it's good for the community in that we're giving fresh food to people who wouldn't normally have it, and it's good for the economy because when we do events like this, we're buying from local farms," food truck manager Emmet Moseley said as he prepared lunches to sell to customers at the downtown stop Friday. 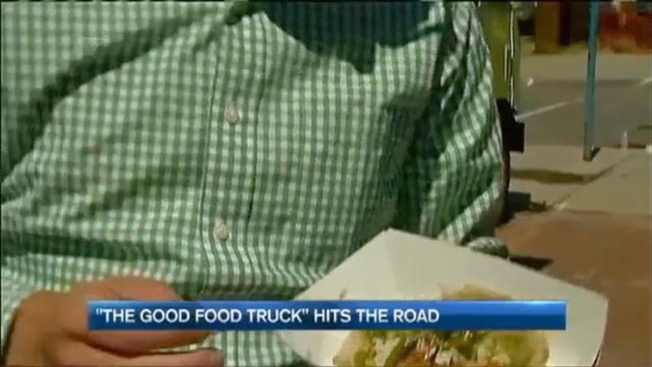 The Good Food Truck plans to keep rolling through the fall, including serving food at the South End Art Hop in Burlington in September. Information about its locations is available on Twitter, by following the truck at @goodfoodtruckvt. Visit the truck's website for more details.